Located in the Eastern Caribbean on the beautiful island of Barbados is a small environmentally friendly boutique hotel called ECO Lifestyle + Lodge, which was formerly known as Sea-U Guest House. This eco oasis is located on the east coastline of Barbados, tucked away in the seacliff, you'll see and hear the Atlantic Ocean that kisses the shorelines below this green hotel. ECO Lifestyle + Lodge is not only beautifully built in the traditional Bajan style, however the hotel is a responsible travel choice as this boutique hotel has made a firm commitment to meeting the highest international standards towards the environment, conservation and corporate responsibility. When traveling there are always a few aspects that factor into my decision on where to stay. The primary is always making a responsible choice in an hotel that offers a green & eco choice, the second is the view and the ambiance. The view from the rooms and the beautiful 17th century traditional Bajan veranda is filled with stunning views of the Atlantic Ocean, as well as beautiful palms and foliage. While I didn't see any monkeys during my stay, ECO Lifestyle + Lodge mentioned that they are often spotted around this little slice of eco paradise. The rooms at ECO Lifestyle + Lodgewere exactly what you would hope for in a little hotel by the sea. They breathed simplicity and openness with both touches of tropical, the beach, and nature. The mosquito nets around the bed where a very nice touch and something that I used nightly while here in Barbados, as there are many mosquitos (and I must have sweet blood, because they always choose to bite me first). The kitchenette in my room was a really nice touch and always comes in handy when storing snacks and drinks for the beach. Breakfast, lunch and dinner at the ECO Lifestyle + Lodge is prepared and served outside in the the open air gazebo, which also houses their kitchen. I found breakfast, coffee, and the fresh sea air to be the perfect place for me to get some work done on Florum Fashion Magazine. You can see that I was putting together the finishing touches on our gorgeous editorial 'Silver Linings' that was photographed by Marc Martinon. ECO Lifestyle + Lodge offers to include breakfast when booking and I would 100% suggest that you choose to include breakfast. They offered both a traditional buffet, as well as a made to order menu that included everything from pancakes to eggs and a few options for meat eaters as well. I am a dairy-free vegetarian and was able to have a delicious breakfast each morning (seriously I suggest trying the pancakes, as they were my favorite each morning). When I visited the ECO Lifestyle + Lodge it was still called the Sea-U Guesthouse, and dinner was by appointment only. Since their revamp and new name the ECO Restaurant now has Le Cordon Bleu-trained Executive Chef Alisha Dawn Stoute and she has collaborated with renowned plant-based chef Manuela Scalini to create inventive, clean and wholesome dishes that offer a new take on Barbadian cuisine. The kitchen sources farm-fresh ingredients including organic fruits, vegetables and dairy as well as cage-free eggs and fish caught locally and sustainably. Working with local fishermen and farmers, they have created a true farm and sea-to-table restaurant, that I can not wait to go back and try again. Just a short 15 minute walk from the ECO Lifestyle + Lodge is the beautiful Andromeda Gardens. For only a few Eastern Caribbean dollars I spent a few hours walking around and taking in the beautiful gardens and the flora. Bathsheba, Barbados is a very small town and only has a few restaurant options besides the ECO Lifestyle + Lodge own dining option. One of my favorite places that I found via the suggestion of ECO Lifestyle + Lodge was right next door at the Atlantis Hotel. Being a dairy free vegetarian (I call myself almost vegan) can be extremely hard in the Caribbean, however the Atlantis offered so many delicious vegan options, that I had lunch here all three days. The wine selection at the Atlantis was also wonderful, pictured above was a delicious glass of Chablis. 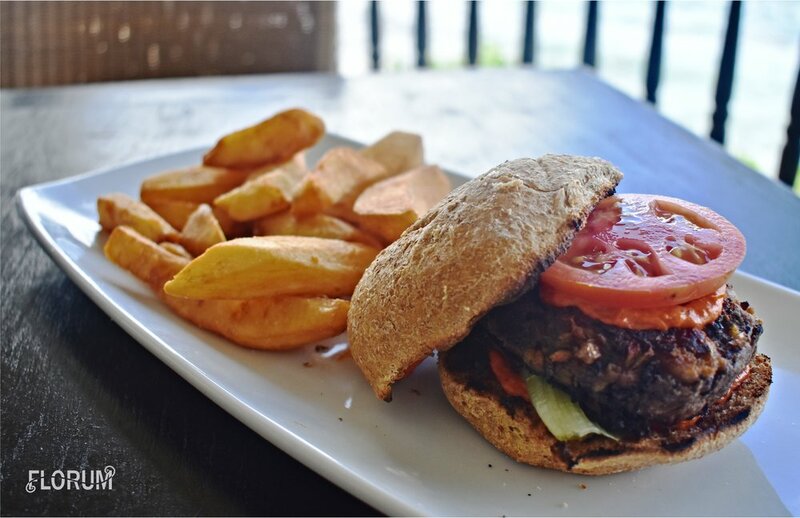 The vegan burger that was made in-house, was my favorite lunch by-far at the Atlantis Hotel. The vegan quinoa salad was seriorusly so tasty, I ended up loving all the seeds they added to this. Another favorite that I had on my last day in Barbados before catching my flight was the vegan pesto, pine nut pasta salad. After lunch at the Atlantis Hotel, I took a short walk down the beach where I saw this colorful boat up on blocks in front of the Tent Bay Fish Market. I ended up taking a few shots in front of this colorful local fishing boat to show off the beautiful sarong that I was wearing from ECO Lifestyle + Lodge. I loved that in every guest room ECO Lifestyle + Lodge two beautiful sarongs are provided for guests to use as coverups for the beach, I loved this one so much I almost bought it to take home (however I decided that my photos and memories of this beach day were enough and choose to practice minimalism instead). My swimsuit is from ethical eco conscious Australian brand Allerton Swimwear. After passing Tent Bay Fish Market, you'll see a trail that leads up the hill with a pathway towards both Bathsheba Beach and Cattlewash Beach. The east side of Barbados faces the Atlantic Ocean, which means that their are riptides. It is not advised to go swimming in these waters, however you will find mnay advanced swimmers and surfers in these waters. While they caution swimming on the Atlantic side of the island of Barbados, I could not help but head to the beach and spend some time in the water. Please note that I swam competitively USS and was a lifeguard for many years, so if you are not an advanced swimmer, stay on the beach and out of the water or you risk drowning. I choose to wear my green bikini from ethical eco conscious independent sustainable designer Pirra Griffiths, who launched her environmentally conscious brand Allerton Swimwear in 2015. This Australian label is one of my favorites because of their commitment to help change the garment industry from the inside out. Allerton chooses responsible fabric choices (including fabrics that are made of recycled materials, as well as reclaimed or deadstock fabrics), ethically manufactures their garments, and provides female garment workers with both fair and safe working conditions. Whenever traveling, it is just so important to respect the environment and the home of the locals. My heart skipped a beat when I saw this trash can on my way back to ECO Lifestyle + Lodge from Bathsheba beach. Not pictured is the recycling for glass, plastic, and paper that is out front of ECO Lifestyle + Lodge in the parking lot. I only recently tried Pevonia Botanica tinted moisturizer with SPF 30 and absolutely loved the texture and how long it lasted. I honestly couldn't believe that this non toxic phyto-organic and natural brand had been around since 1991 and I have only just now gotten my introduction to it. 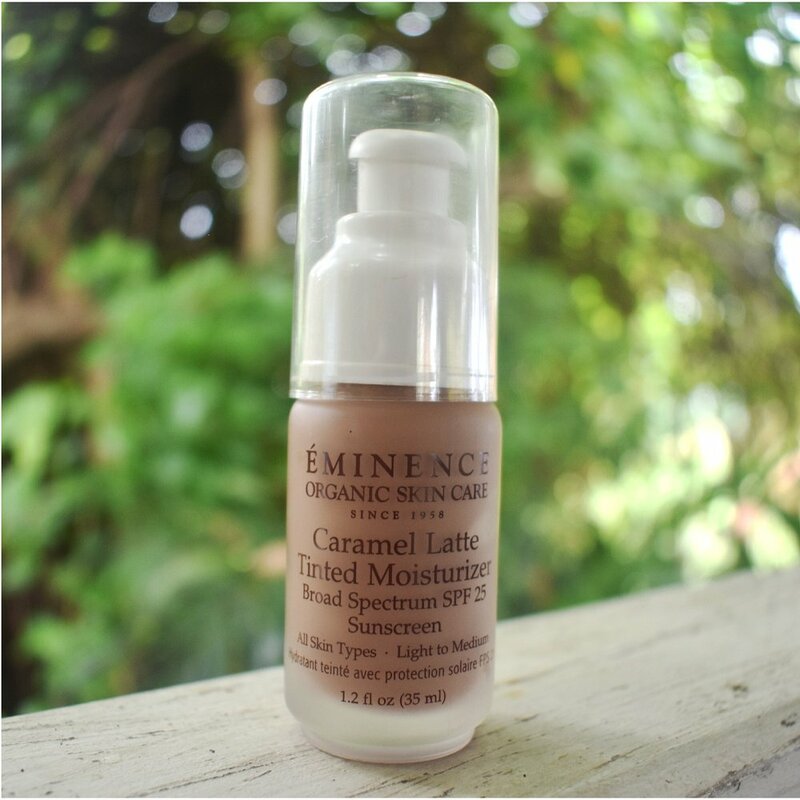 Eminence is a brand that I was first introduced to from getting a facial, however it wasn't until a few years later did I start using this organic tinted moisturizer with SPF 25 as a bronzer. One trick I have learned if I am sunkissed and a little more tan then normal, is to add a dollop of this. 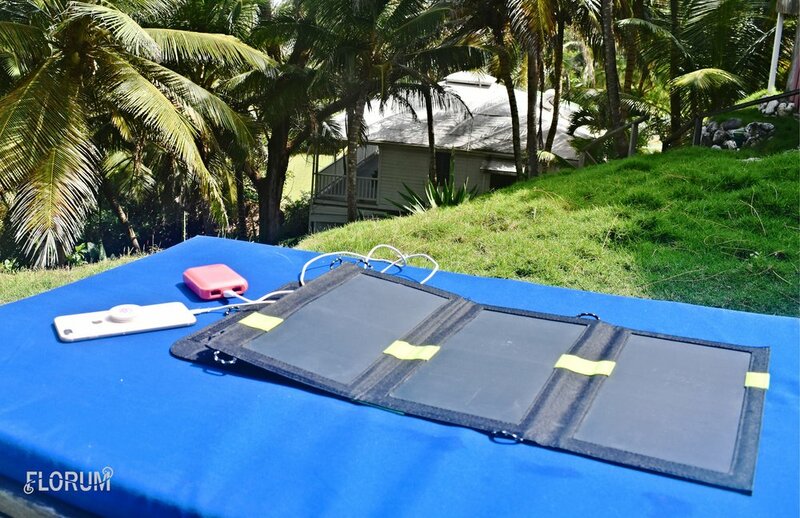 One of my favorite travel essentials is a a portable solar panel. Not only does it reduce my carbon footprint, but it also comes in handy when I am not around power outlets or electricity. I always bring an extra power bank, so I can store up extra elctricty for night time.